It’s Vulcan’s Birthday Weekend and all of Birmingham is invited to his Bday shindig! In addition to V’s big day there are multiple food festivals as well as a Red Mountain Scavenger Hunt! Check below for all the details on these great happenin’s! In conjunction with the exhibition "Magic City Realism: Richard Coe’s Birmingham," the BMA is pleased to present a lecture by Lynn Katz, a scholar in the field of Southern printmaking. Katz will discuss a selection of Alabama printmakers, including contemporary artists working in Birmingham today. This talk is FREE! Join in for a viewing of Dan Pallotta's TED Talk "The way we think about charity is dead wrong" and a lively discussion over FREE PIZZA afterwards with your fellow young nonprofit professionals! Here's a blurb on the video: "Activist and fundraiser Dan Pallotta calls out the double standard that drives our broken relationship to charities. Too many nonprofits, he says, are rewarded for how little they spend -- not for what they get done. Instead of equating frugality with morality, he asks us to start rewarding charities for their big goals and big accomplishments (even if that comes with big expenses). In this bold talk, he says: Let's change the way we think about changing the world." The Birmingham Barons are back for another Thirsty Thursday homestand! Come root for our home team and enjoy drink specials! This is always a great event for a group of friends to attend together! Don’t forget that Birmingham YP Members get in FREE!!! It’s National Donut Day which means it’s time to hit up your local Donut Shops! Every year places like Heavenly Donuts, Hero Donuts, Daylight Donuts, We Have Donuts, and more have some cool specials in honor of this great day! Check their Facebook pages to find out what all will be in store! You DO-NUT want to miss this! Showcasing local artists, Birmingham Art Crawl at the Village celebrates our city’s growing art scene. Rain or shine, each week will feature dozens of artist booths on the sidewalks and inside of Brookwood Village. You’re invited to come and connect with resident artists, listen to live music, dine at Brookwood Village restaurants and enjoy dessert food truck vendors. This week, delight in live music from The Divines, an electronic dance and funk cover band based out of Birmingham, Alabama. Complimentary face painting will be provided by Magic City Face Art, making Birmingham Art Crawl at the Village an entertaining evening for all! It’s the third Party on the Porch of the season! Enjoy good company, good food from Off The Hook Food Truck and Catering and Urban Pops, good brews from Avondale Brewing Company and good tunes from Tonal Vision, all while doing good for our community. Proceeds from Party on the Porch benefit the Cahaba River Society. Through conservation, stewardship, and education, the Cahaba River Society ensures that the river will thrive for generations to come. This is a family-friendly event. We hope to see you there! • Live Music and DJ set with Birmingham’s own Michael Warren • Wine tasting with International Wines and Craft Beer • Cocktail Sampling • Americana Themed Menu • Art Activities Current Junior Patrons get in FREE!!! Our friends at Red Mountain Park are hosting a #NationalTrailsDay Scavenger on Saturday at the park! Join in for a unique day out on the trail that will include a scavenger hunt with multiple fun prizes to be discovered throughout the day! You can enjoy the trails in a whole new way and win cool stuff! Do you like to walk outdoors and enjoy a beautiful, historic landscape? Do you slow down when you drive past an older cemetery? If you said “yes!” to either question, we have the event for you! Pay online for a discounted price of $8, as the tickets will be $10 at the door. You’ll be sure to learn a thing or two as you are guided through this hauntingly beautiful cemetery! You're invited to a family-friendly Oyster Festival with Costa Sunglasses and Schaeffer Eye Center on Saturday at Schaeffer Eye Center Hoover! Enjoy fresh-shucked and locally grown oysters, music from 104.7 Birmingham's WZZK, casting lessons from Costa del Mar bass fishing pros and giveaways! Enter for a chance to win a pair of Costa sunglasses, trip with Costa bass fishing pros, Keith Urban autographed guitar, tickets to an upcoming Keith Urban concert and more! Don't miss this unique event in the greater-Birmingham area with exclusive day of promotions! The Alabama ALS Junior Board’s second Birmingham Burger Fest will be Saturday at Avondale Brewery! Groups of amateur chefs and restaurant owners will be competing for the title of Birmingham’s Best Burger! A ticket includes entrance to the event and 4 sample tickets to taste some delicious burgers! Head over and enjoy some music as you cast your vote for the “People’s Choice” for Best Burger! It’s back! This is a fun-filled Chicken Wing Challenge that will include live music and a kids area. Can you take the heat? 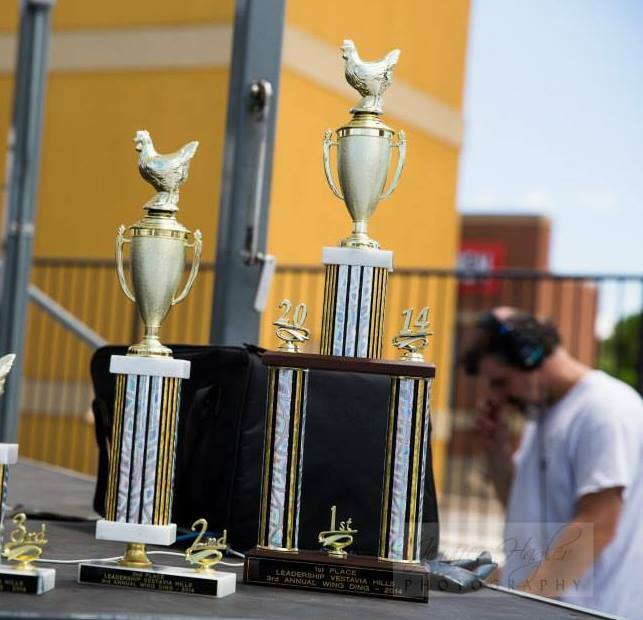 Head over and try some delicious wings as teams compete for the 2018 trophy! Proceeds benefit the Cystic Fibrosis Foundation. Streetfest is a free event at one of Homewood's favorite parks. Live music, food, vendors and the most friendly neighbors around! You’ll want to bring the entire family out for this much anticipated annual event! Be sure to stop in Magic City Sweet Ice while you are there and tell them we said hi! Get a headstart on your Father’s Day shopping at one of the best markets in town! Shop 25 Artists and Makers and enjoy the Tamale Queen Food Truck + Alabama Peanut Company. Musical artists brought to you by Moonlight On The Mountain. This is a relaxing way to spend a Sunday afternoon! Make plans to attend the BIGGEST birthday bash in Birmingham! Vulcan may be the world’s largest cast iron statue, but he still needs help blowing out his birthday candles! There are activities for the whole family in celebration of the Big Guy’s 114th Birthday. This event is always full of fun surprises! Come view a demonstration of fresh, simple recipes you can easily replicate at home, as well as sharing healthy eating tips. The first 100 registered participants receive a FREE bag of produce from Piggly Wiggly Clairmont Avenue! Registration will open 30 minutes prior to class. Class will take place at the 17th St. Plaza at Railroad Park. This is part of the ongoing series by Blue Cross Blue Shield of AL. Head to Avondale Park for an evening of fantastic Jazz music under the stars! This historic venue is perfect for a summer concert. You can grab a bite to eat at one of Avondale’s incredible restaurants before heading to the park! Don’t miss out!